1. Combine flour, salt and herbs in a food processor; pulse to mix. Add butter, a couple of pieces at a time and pulse the food processor until mixture resembles a coarse meal. 3. Remove the dough from the food processor and place in a mound on a clean surface. Gently shape into a ball, flatten like a hamburger patty. Lightly dust with flour, wrap in plastic wrap and refrigerate for at least 30 minutes, preferably an hour. Note: This re-chills the butter and gives the gluten in the flour time to relax. 4. Remove the dough from the refrigerator and allow to sit at room temperature for 5-10 minutes in order to soften just enough to make is easy to roll out. 5. Using a rolling-pin, on a lightly floured surface, roll the dough to a 30cm circle, about 0.4cm thick. Place the rolled out dough on a piece of parchment paper on a baking sheet, or on a pizza peel for transfer to a baking stone. 1. Place the squash, apple and onion wedges in a bowl. Pour the melted butter over the content in the bowl. Add the thyme, rosemary, salt and pepper and gently stir (or toss by hand) to combine. 1. Using a brush, or spoon, spread the whole-grain mustard over the rolled out dough. 3. Gently pull up the edges of the dough to encase the sides of the filling, folding and pleating it into place. Transfer the baking sheet, or the parchment directly onto a baking stone, into the oven. 4. Bake until the crust is browned and the filling ingredients are tender and caramelized, about 50 minutes. At that time, scatter the cheese over the filling and bake until the cheese has melted, about 5 minutes more. 5. 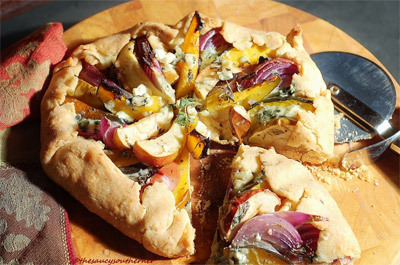 Remove the galette from the oven and cool briefly on a wire rack. Cut into wedges and serve. Notes: You can make this dough without a food processor...simply combine the dry ingredients in a bowl, cut in the butter with a fork or pastry blender and drizzle in the water while continuing to stir. Do not overwork the dough.